Our mission is to provide lifelong learning opportunities for people of all ages in the Shoals area and beyond. We serve as the University’s primary means of extending its educational and training resources to the non-traditional student, especially to adults seeking continued personal and professional development, and to employers seeking updated workplace skills and productivity-improving knowledge. The Center for Learning and Professional Development is located in the UNA East Campus Building, at 1640 Tune Avenue, Florence AL 35630. Parking and classroom access is located behind the building. 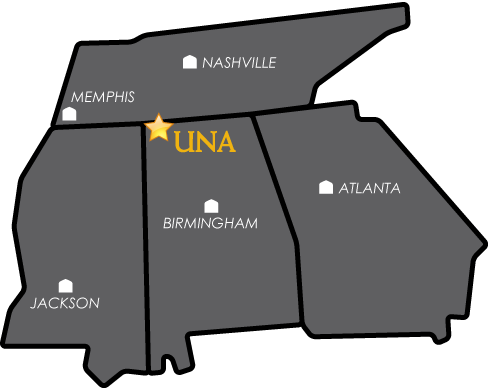 Most of UNA’s Continuing Education classes take place at the East Campus. Classroom assignments will be given in your confirmation letter after registration. Please register early! Cancellation decisions are made three days prior to the start date. Minimum enrollment standards are established for each course, and if a course does not meet that level it will be cancelled. Registration is available by phone (256-765-4862 or 1-800-825-5862, Ext. 4862), in person at 1640 Tune Avenue, Florence AL 35630, by fax (256-765-4872) or register online here. The Center for Learning and Professional Development reserves the right to change instructors, times, and dates to better facilitate the program, and will notify students if this occurs. Unless noted otherwise in the course description, books and supplies will be furnished by the Center. Failing to attend a non-credit course does not constitute withdrawal. Please notify the Center directly. If withdrawal is made at least three working days prior to the course start date, a complete refund will be provided. Refunds will not be available after this time. Participant substitution may be made at any time. Non-credit courses are subject to cancellation if there is insufficient enrollment. The Center for Learning and Professional Development apologizes for any inconvenience this may cause. In the event a course is cancelled, the registrant has the option of applying the fees paid to another course or receiving a complete refund. The Continuing Education Unit (CEU) is a nationally recognized method for noting non-credit Continuing Education participation. One CEU is awarded for each 10 hours of participation. Some programs carry other professional acknowledgments. Certificates of attendance listing the number of CEUs and other approved hours will be available.